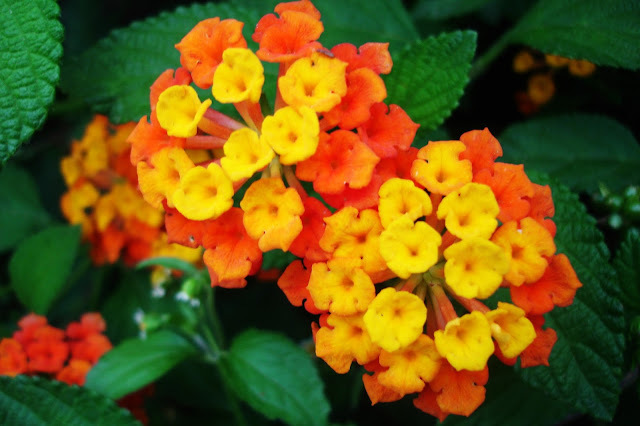 Lantana is a genus of about 150 species of perennial flowering plants that are native to tropical regions of Americas and Africa although they've been introduces to various areas including Asia. As a matter of fact they are in abundance around here in Uttarakhand, India and in and around the hills of the Himalayas. Lantana's umbels (flower clusters) are a mix of red, yellow, orange, pink, blue and white florets. According to readings, the flowers typically change as they mature which, as you can see, become a combination of tow- or three-colored flower cluster. I have come across this flower through the film of its name, Lantana. Then we don't know what exactly the word is although my husband had the idea that it's a flower based on the name so before watching the movie we looked up on the internet and voila! we found out that it is, indeed, a flower - a colorful and beautiful flower.